Generally speaking, using a websites intended mobile version is recommended when the site is accessed from an iPhone or iPod touch, since mobile websites tend to be optimized for smaller screens. 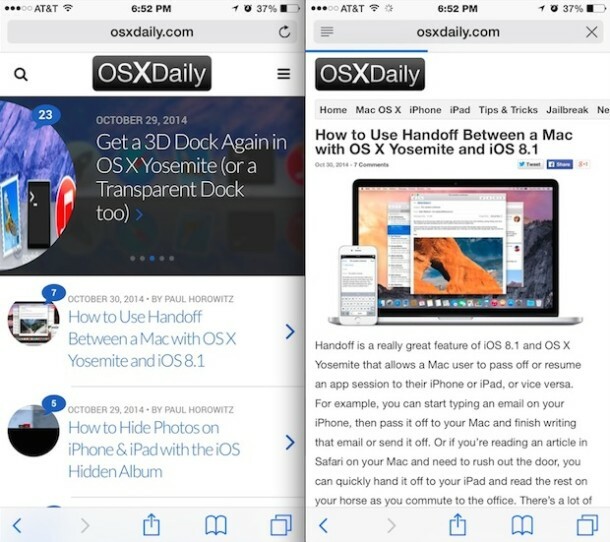 Nonetheless, sometimes a user visiting a mobile site may wish to access a desktop version of the same website from their iPhone, iPod touch, or iPad, without having to use Handoff to pass the page off to a Mac. You can request the desktop version of a webpage easily in Safari with new versions of iOS, though if you’re familiar with the older approach then you’ll notice the feature is accessed differently than prior versions of Safari on iPhone and iPad. 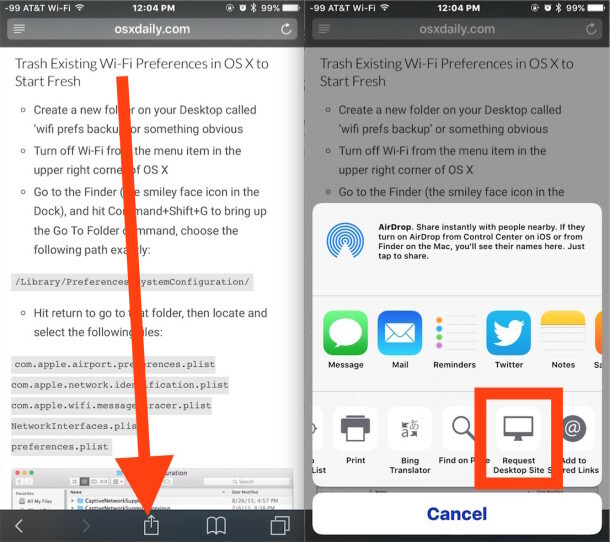 This trick works the same to request the desktop version of a site in Safari for iOS 12, iOS 11, iOS 10, iOS 9, and on both iPhone and iPad. Almost all websites will allow users to request the desktop version instead of the mobile site, but some don’t, which is why the button is called Request not Demand Desktop Site. You can also go the other way and request a mobile site if you’re served a desktop version erroneously. Generally speaking, if you’re on a mobile device, you should use the mobile version of a site, as they’re almost always optimized for the device screen and allows for improved usability. This is directed at Safari in modern versions of iOS, whether it’s iOS 12, iOS 11, iOS 10, iOS 9 or later, but prior versions of iOS users have been able to request the desktop version of a webpage in prior versions of iOS Safari too, but through a less intuitive approach that involved pulling down from the top of the URL bar. Now the feature has simply moved to an easier and more accessible location. But numerous sires, notably ESPN! NYT, WAPO, ZDNet, will not serve up the desktop versions. Maybe they don’t understand that people actually use iPads. You can also access this by pressing and holding on the reload page icon in the address bar. Nice! I’ve tried so hard to access YouTube’s desktop site for the past year. I just tried it and it worked. It asked to open in app, I hit cancel, then tried it again and it opened the desktop version. Thanks for the tip! Hi, you make mention of being able to revert back to the mobile site once the desktop site has been served, but I cannot work out how to do this. Do you have any advice for me, please? Unfortunately many, many sites, including this very one, do not honor the request. It sounds like you can’t figure out how to use the ‘request desktop site’ feature on your iPhone. Like most technical issues, the problem is usually user error. Read the instructions and try again. No he’s right. In many websites it still reloads the same mobile version of the website even after tapping on ‘request desktop site’ in safari. It doesn’t seem to happen in google chrome, however. By the way on iOS 9 or later, the request desktop site feature is also accessible by tap and holding on the reload button (circular arrow on the right hand side pf the url address bar).